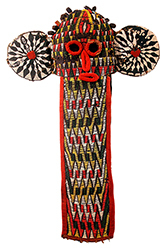 The Bamileke beaded elephant masks below have been sold and are left here for reference and educational purposes. These masks, with beads carefully embroidered onto cloth take the form of an important royal icon, the elephant, with its long trunk and large ears. The patterns on the front and back panels suggest another royal icon, the leopard. The display of wearing these richly embellished masks and other regalia at court ceremonies was the best evidence of the wealth of a Bamileke kingdom. Some of the old masks have lost beads, others, including the newer no. 6 are all intact. These were photographed on a temporary stand; mounted permanently, the sagging ears can be braced up to look more like no. 6. Only No. 4 has basketry inside the top. On some, uneven lighting causes the top to be too light. The color is most accurate in the closeups and enlargements.